Once again I endeavor to see what elements we have, if possible as an ancient Egyptian would do, in the light of all that I have seen and learned. 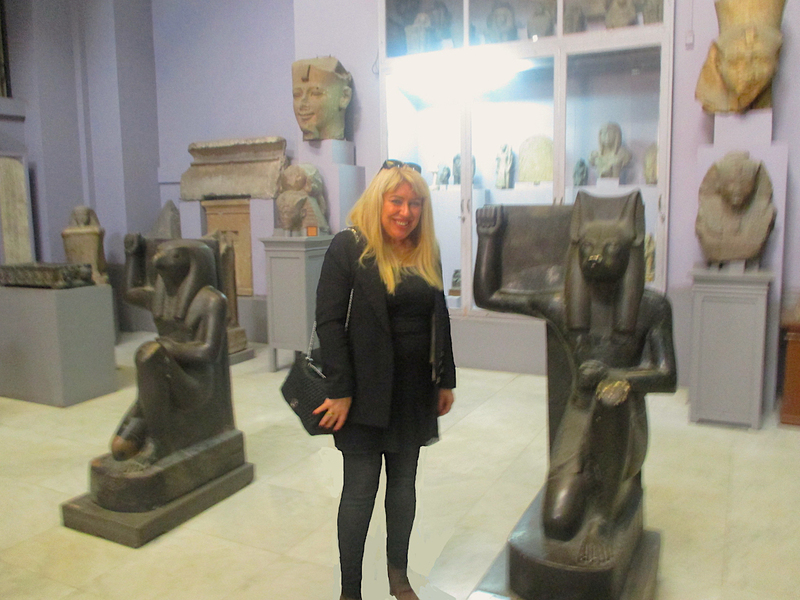 On the ground here, in Egypt, that it seems that I know better than the Egyptians themselves as they like to repeat it everywhere (!) because I know this territory in every corner, and at the same time, thanks to the ancient texts that I have been going through for more than twenty years, because it takes time to rediscover the ways of thinking, the links between things and the very essence of their conception of life, our History. That is why I have been totally immersed in it all this time, a humble and demanding journey, dedicating my life to this sincere and deep research, leaving more conventional and honorary paths, in order to bring you the best, and most importantly: the useful because I am convinced (and more and more) that what the ancient Egyptians knew is fundamental to our future and to a good understanding of our past, and this for all of us. 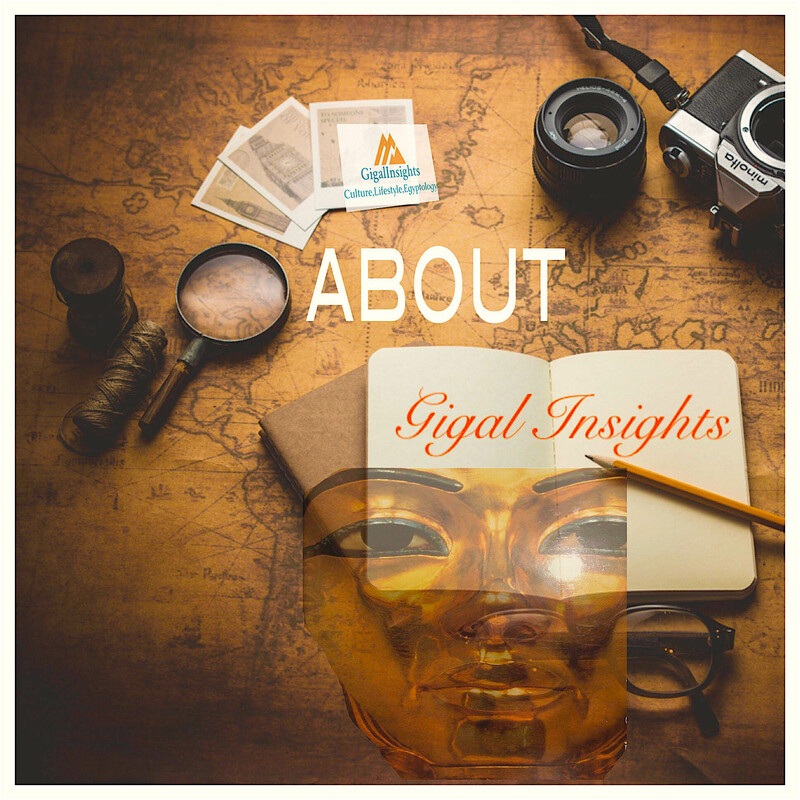 So I invite you to focus on the continuation of this article which requires special attention if you are particularly interested in understanding the meanderings of Ancient Egyptian thought. But once you have focused everything becomes clear. (I recommend you to read it aloud and in one go if you can). This salute Henou is done by Sokar/Horus (a representation of a being with head of falcon) and by Anubis (the representations of a man with head of dog /wolf) in the Egyptian iconography . 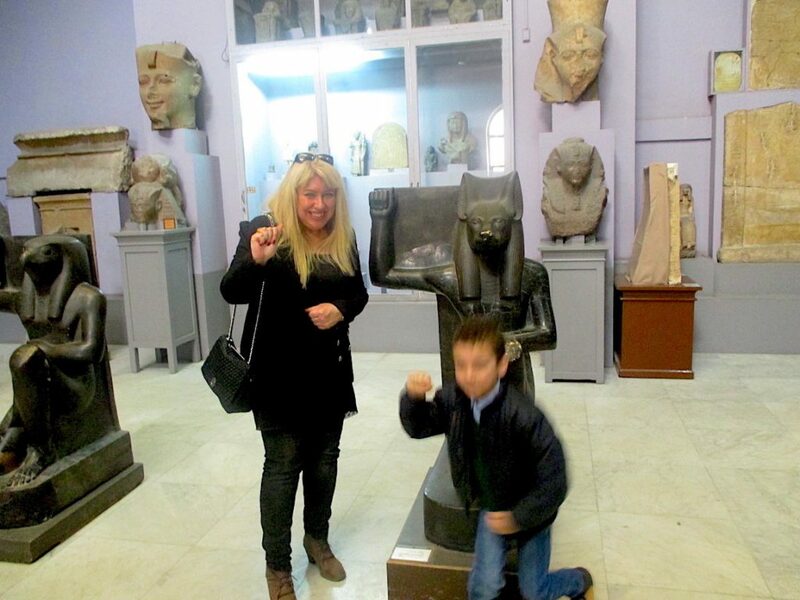 Here is an example in the photo above taken at the Cairo Museum. I am thus in the midst of these two statues and they are the mysterious souls performing this salute. Then what important significance hides behind these two statues? 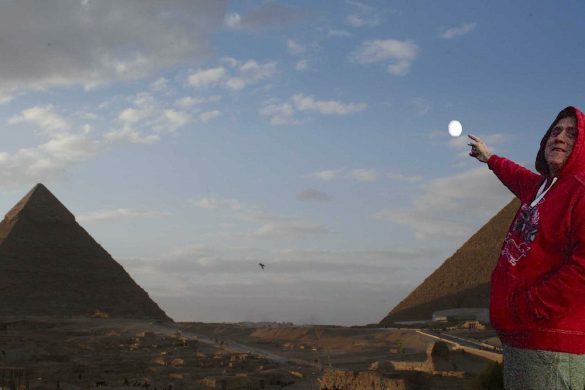 I will try to explain to you this important and significant memory the ancient Egyptians have managed to convey to us. 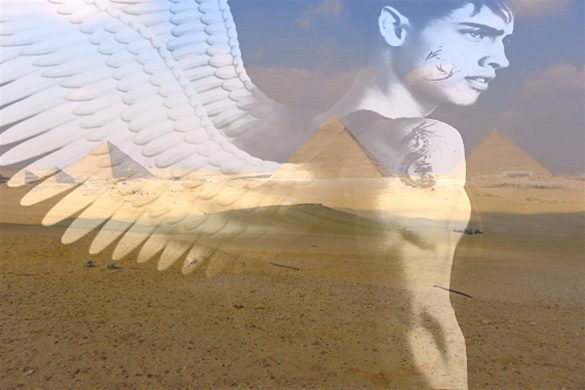 But before speaking to you in detail of this salute Henou and its connection with the two mysterious immortal souls, I must speak to you a little about Osiris and certain sites devoted to him. 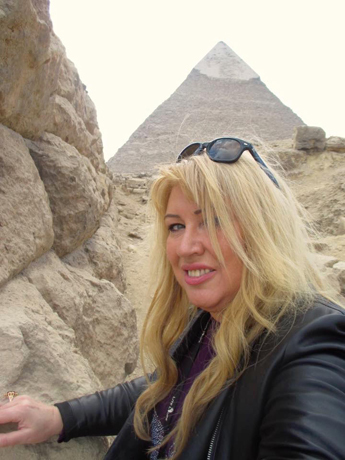 The Giza plateau is, according to the oldest Egyptian texts (Texts of the Pyramids): “Per Wasir neb rosetjau”, ie “The house of Osiris the Lord of Rosetjau” (Rosetjau (or Rosetau, Rosetaw,) and not westernized as : “Rostau” as it is often seen! 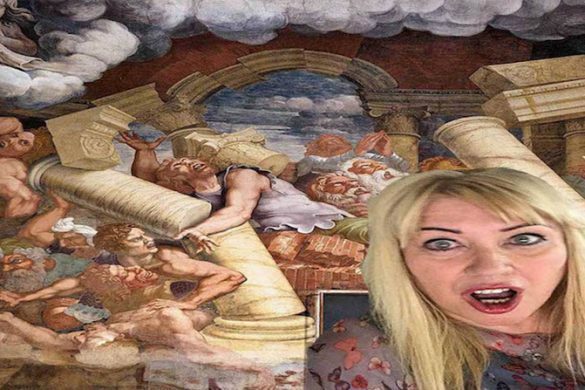 But which can be read: Rasetau or Resatau or Rosetau and which for an ancient Egyptian evoked at the same time: a mouth, mouth of the passages (if one reads Rosetau). 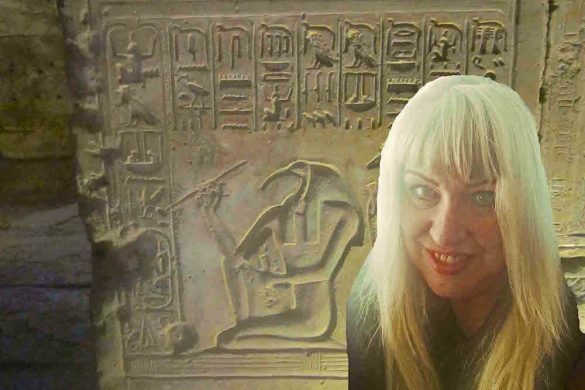 But also with the Egyptian suffix: sta: (to trail, to tow but also to be back)) + u (or “w”, “or”) which is the plural mark, one could understand if it were read: Rasetau: “The place where the sun remains behind ” and that makes sense for an underground! And if one reads it: Resetau: “the place where are the awaken” (from Re: “to be awake”) it is also normal for refugee people in an underground facility ! 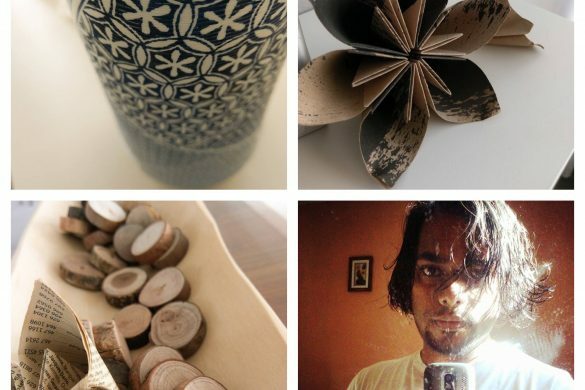 We realize that all these meanings are right in fact, not to mention that this suffix “sta” has a Sanskrit origin and would mean “passage for a destination” (and “seta”: the furrow). 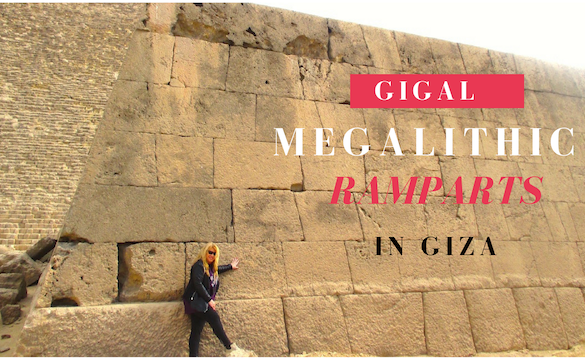 For me Giza is really the departure of undergrounds going to the south of Egypt (we will talk about it). Moreover, the verb “tow” evokes immediately: the divine being Sokar on his sledge progressing in the underground DUAT as it is often depicted marking its furrow in the sand. 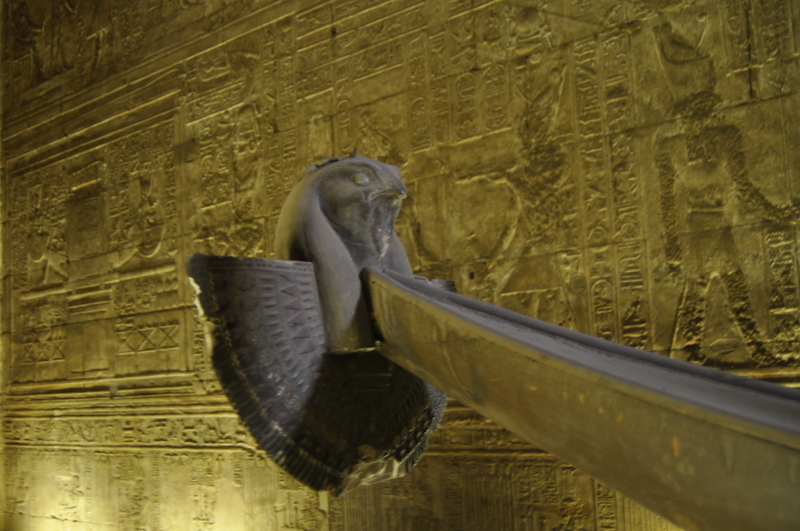 Sokar (or Seker) with the head of falcon, was originally Osiris, a much older Osiris. The name Sokar would come from his scream to Isis (or to God before the arrival of the flood waters, according to other texts): “Sy-K-ri” (“Help!“) according to what is officially translated from the texts of the Pyramids. “Skr” is also indicating the cleaning of the entrance, the protection of the entrance and also purification, and opening of the mouth for the ceremony of the same name. In short: a guardian of an entry which corresponds well for me to the true role of Sokar after studying it for years. 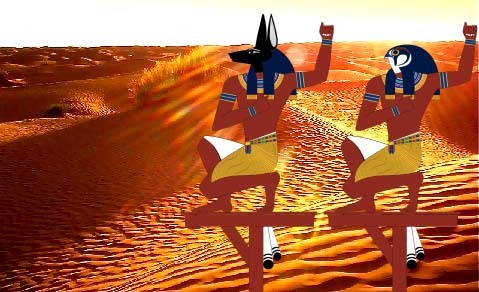 You have to get used to the extraordinary gymnastics that in ancient Egyptian, a word mean several things both by its sounds, pronunciations, representations, which allows to preserve several levels of reading according to your own level of knowledge and also protects against wounds and deformations of time, important meanings. Let us remember that by extension Horus who is the son of Osiris / Sokar has the characteristics of his father ie a falcon head. This is the family mark. So for now let’s remember that OSIRIS is SOKAR and that the son is Horus: all with falcon head, to simplify the task for you. Why is it so important for the topic we are interested in today? First of all, because the name of Sokar’s boat trailed on the sand in the underground passage from Giza on a sledge (ancient Egyptians used a lot sledge in the desert ) is also called HENOU and is written with the same hieroglyph! We will talk about this later. Here is the first link with the HENU salute that we are dealing with today. Other places related to Osiris / Sokar: farther South on the plateau of Giza, there is Abusir : in ancient Egyptian: “Per Ousir“, “The abode of Osiris”. (Do not forget Osiris = Sokar). Then there is Osiris in Abydos, in the south, 550 km from Giza, one of the oldest and most religious sites in Egypt, which is in fact the main site of the cult of Osiris, founded by the Predynastic and Thinites leaders. Abydos place of command of Osiris? In Abydos, in ancient Egyptian : Abdjou: “The hill of the reliquary” (and in Arabic: “Araba el madfuna”, “The hill of buried vehicles (ships)”), one finds, also in Giza and Abousir very old buried boats in the sand. The name of this hill implies that this place in full desert, also raised on a kind of plateau, would contain underground something important and sacred. 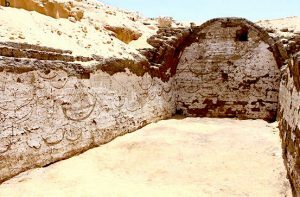 Moreover, in Abydos, the archaeologist David O’Connor discovered in 1991: 12 pits near the shrine of Pharaoh Khasekhemwy (2675 BC, 2nd dynasty officially), then in 2000: 14 Boats which are considered the oldest remains of ships ever found on earth with an even older date, dating back to 4000 BC and more recently others were found near the tomb of Sesostris III. And, according to experts (Matthew Adams project), from NYU-Penn-Yale universities: these boats would not be mere skiffs as the official thesis liked to hammer them (the thesis of so-called symbolic boats to take away the soul of Pharaoh) but on the contrary: they are viable and spacious real ships accommodating up to 30 rowers. And in the Tradition: Abdjou / Abydos is the place where the head of Osiris was buried (understand: where his command was: his leadership, his head (Latin: caput: Head). In other words: Osiris reigning over the subterranean world where was his place of command and we shall see what incredible battle was going on there. 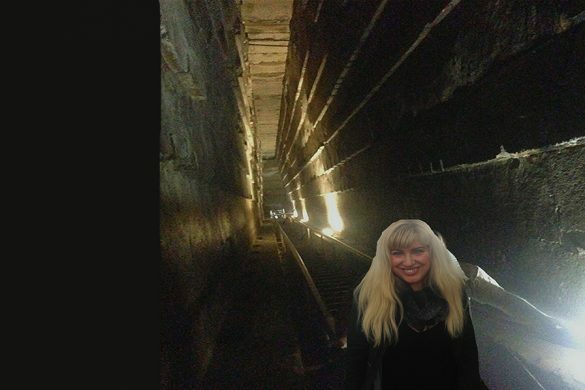 Draw a line between Giza and Abydos and you have there, for me after years of research, exactly the location of the Duat under the earth. In the Book of Amenta, which describes what is in the Duat, it is stated that this underground world is at a depth of 230 m (after conversion) and that to reach it it is necessary to choose between two ways: One by land and another by river. 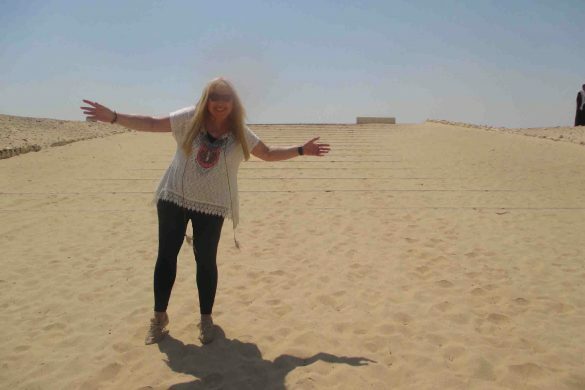 And the largest pilgrimage site for Sokar (Shetuyet), where thousands of pilgrims from ancient times came, was on one side in Rosetau at Giza and the other place of great pilgrimage was at Abydos … At these two places on each side you have buried boats …. It is good to remember that everywhere in Egypt where ships and their pits are found you always find the master of the underworld, Lord Sokar/Osiris as a red wire indicating a path … This path is supervised by Sokar. 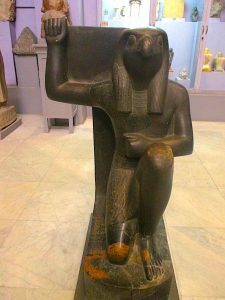 In the book of Amenta: “What is in the Duat”, the underground world, we find Sokar at the 4th and 5th hour of the Duat and hdfe is called : “King of eternity, Prince of the Earth of silence , Inspiring a great affection “often depicted with two wings spread and his head of falcon. 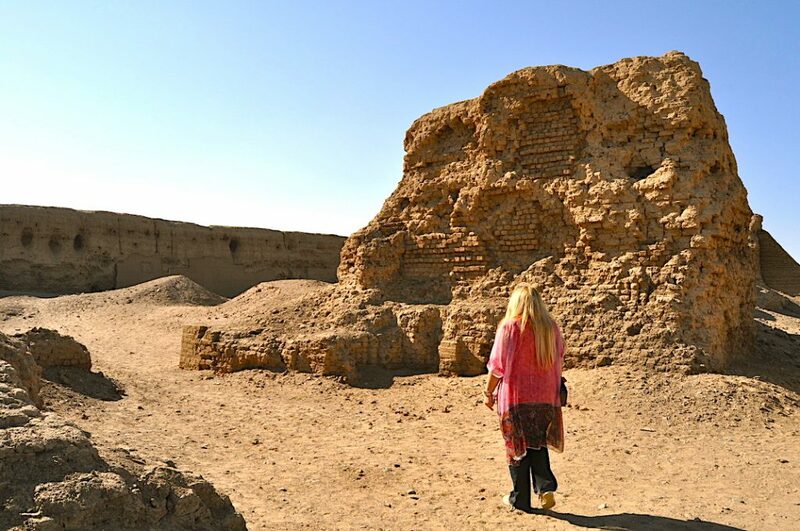 We know from many writings that Sokar lives in the Duat on a strange land where even Râ has no access, an unprecedented fact in the Egyptian pantheon but well explained by the fact that the sun does not enter the underground. 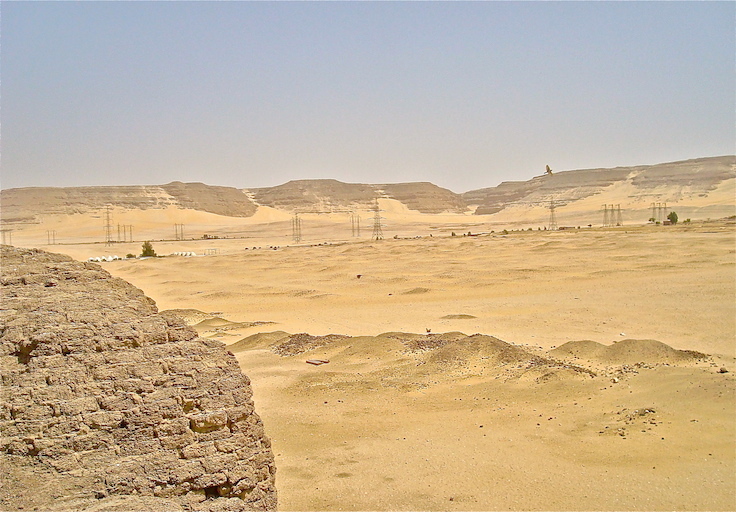 It is often depicted on a hillock where there is a black cone: the hill of Abydos, or that of Giza. And it is said that those who venture into the Duat by boat see their boats turning into a serpent (to snake) to be able to walk along the shores of the kingdom of Sokar. There is also the “Book of the two ways” which was formerly called the “Book of the paths of Rosetjau” … And for me it is not a mythical geography but a real one … which was mythified later. 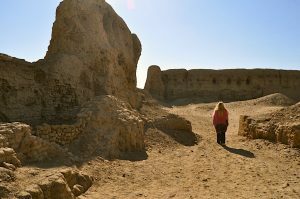 So what happened in Abydos/Abdju? In an inscription by a high priest of Osiris : Nebwawi under Thutmosis III, mention is made of “the ark” of Osiris at Abydos. And in the stele of Ikhernofret: “Master of Secrets and Great Treasurer” under Senusret III (1848 BC), it is written how he received command from the pharaoh to build monuments as an offering to Osiris at Abydos. And there is mention of the celebration of a very important feast called “Feast of going to the Day light“ (this reminds you of the true title of the Book of the Dead which must be translated: the “Book of coming forth by day”). But this festival is very revealing. It was the commemoration of a kind of “Passion” that took place at Abydos itself. 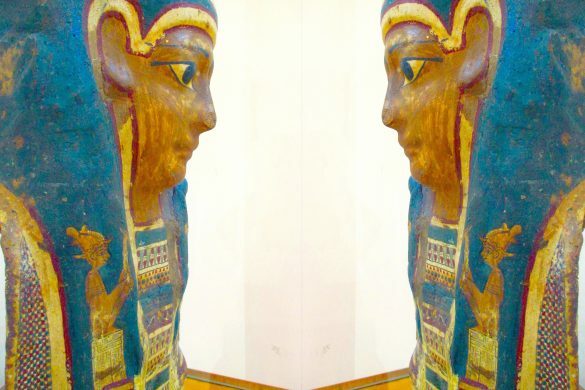 In the procession, the boat called “Brilliant in the Truth” was brought in and a statue of Upuaut/Anubis was inside: “The path opener”: son of Osiris (and Nephthys) advancing on calm waters (after a severe flood?). 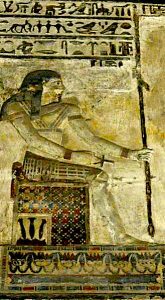 His fights to defend his father Osiris (locked underground) were mimicked , his arrival in his refuge at Abydos to rescue him and his victory were reproduced every years. There are many traces of a fight between the son of Osiris-Sokar and the dark forces of Seth in order to be able to help his father who had taken refuge under the earth in the famous hill of Abydos. In addition, other boats had come to the aid of Osiris like that of Thot. This feast is a true reconstruction of the great fact of the past that Ikhernofret calls “the day of the Great Conflict” as JH Breasted remarkably translates it: “I celebrated the great (Upuaout/Anubis) and: “I have repulsed the enemy from the sacred boat, I have overthrown the enemies of Osiris” … Imagine that the reconstruction of this battle was repeated every year for centuries not only by the high priests but by all the people who were fighting to play a part in the procession and the battle reconstituted as an anniversary. Juvénal the Roman author (1st century and 2nd century AD) who had taken refuge in Egypt tells, like Herodotus (428-425 BC), that people, moreover, participated to this reconstruction with great enthusiasm: it was a question of repelling the dark forces! It was not for nothing, it was absolutely necessary to maintain in the memories this ancient fact. Powerful enemies had tried to block the exit of Osiris from its underground refuge at Abydos (during or shortly after a big flood?). And this great battle is described as a victory for mankind. 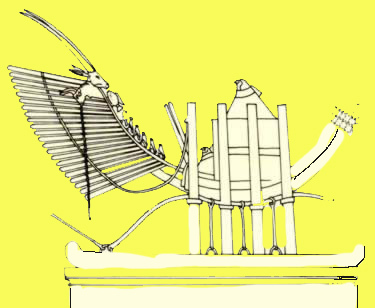 In “The book of the heavenly cow”, the story begins with a version of the flood in Egypt in the chapter “History of the Destruction of Humanity”, where it is related that men and gods lived in harmony, until some of them on earth, led by the group of Apap (Apophys in Greek) (called hydra-serpent) rebelled against Ra who was forced to send a flood to end this evil group while preserving some others. Nor do we forget that if the name of Osiris is mentioned for the first time in the so-called Pyramid text dating back to 2300 BC, Egyptologists like the great Budge, and many others, declared that the content of this text is the result of thousands of years ago. So now you know the Osiris / Sokar boat called Henu as well the Henu salute that interests us here, you saw the link between Anubis and his father Osiris: his battle on the water in Abydos to deliver his father blocked by Seth in his underground, preventing him from going out in the “light of day”, a battle named the “day of the great conflict“ against the dark forces and commemorated every year for centuries by the Egyptians. Only now will we be able to talk about the two mysterious souls linked to the Henu salute. These two souls, these two Neteru who are linked to the salute of resurrection Henu are Anubis and Horus/Sokar as I told you at the beginning of this article. These two souls, and their clans represent the great Ancestors and had two places of origin and predilection, two true sanctuaries (sacred, by their association with the Divine), they were called “The Souls of Pe and Nekhen “. The Souls of PE with their falcon-headed totems (those of Horus, Osiris, Sokar): have their town of PE (Buto) in Lower Egypt, discovered by the great archaeologist Flinders Petrie in 1888, about 90 km from Alexandria on a branch of the Nile, on the site of Tell el Faraun (the hill of the pharaohs) offered to Horus when he had been wounded during his battle for the throne. 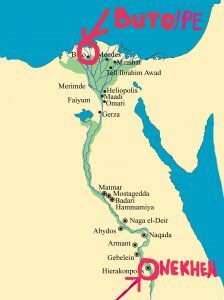 PE/BUTO was already a very important site in the pre-Dynastic period and was originally two towns separated by a channel: PE and DEP, united in one, which was named PER-WADJET under the protection of Wadjet the protective goddess of Lower Egypt, the delta, and the Pharaohs, with her great oracle. It is also known that there was an important sanctuary of Horus and later one of Isis. As a reminder, it was Wadjet who protected Isis’ son: Horus from the murderous anger of Seth. These two souls, these two representatives and ancestors of the two clans with dog and falcon totems are represented in all the Pharaoh’s crowning scenes and were called the BAU (“b3w”: Souls) and they are always represented doing the resurrection salute HENU. Even the Kushite Pharaohs (from Nubia and Sudan) revered these two souls particularly, considering themselves their descendants. 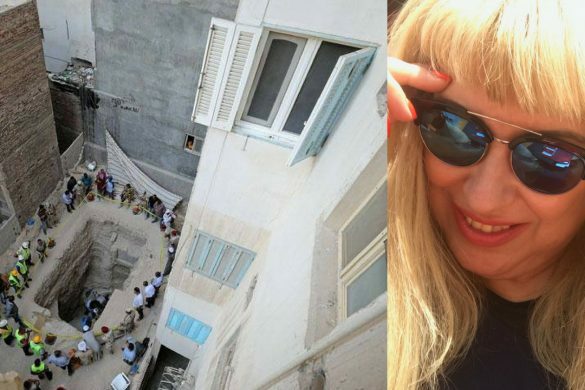 The BAU of Pe and Nekhen are indeed the representatives of the Egyptian ancestors victorious men who survived at least one flood and a terrible battle where they put all their forces at the service of humanity. These are the ones that have been named: the Shemsu Hor: the descendants of Horus. Now I am going to be able to explain to you the meaning of the raised fist and of the one on the plexus, on the heart, in the Henu salute, something which to my knowledge has not yet been done at this time. For the raised fist: it is said that in PE / Buto there were also the two sons of Horus: Imsety and Hāpy. IMSETY who was represented with a man’s head, a guardian of the South and a representative of the liver (theliver guardian in funerary canopies) (I remind you that the liver is the multi-function organ par excellence in the human body) Strongly linked to Isis. And HĀPY depicted with a baboon head, guardian of the North, representing the lungs (guardian of the lungs in the funerary canopies) and connected to NEPHTYS. And it is said that at NEKHEN there were the other two sons of Horus: Douamutef and Kebehsenouf. DOUAMOUTEF represented by a head of Anubis, guardian of the East and representative of the stomach (guardian of the lungs in funerary canopies) and connected to NEITH. And: KEBEHSENOUF at the head of falcon protecting the intestines, guardian of the West and connected to SELQIT. So there are: Horus + Imsety + Hapy + Douamoutef + Kebehsenouf as the 5 fingers of the hand, the victorious ancestors, the 5 clans that are still protecting beyond death. For that reason the fist raised to heaven recalls the divine force that these five beings and their descendants served. 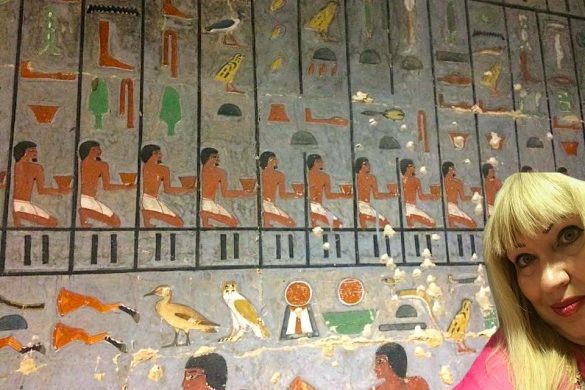 There is a very interesting genealogy to study, may be the oldest in Egypt, which should bring , many elements for a good understanding of Egypt from the origins. ►YOUTUBE: https://www.youtube.com/user/antoineGigalEGYPT/videos Please register to my youtube channel ! 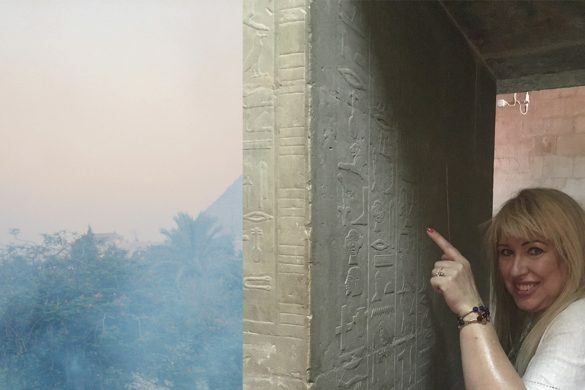 ► INSTAGRAM : https://www.instagram.com/antoine_gigal/ Everyday new pics from Egypt ! 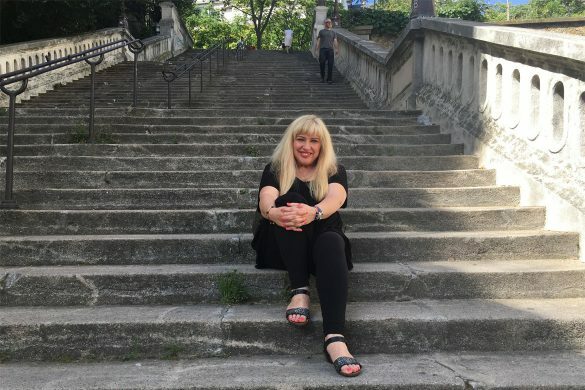 Register to my NEWSLETTER on this blog: right column ! -Book of the Heavenly Cow  : inscriptions in  Tutankhamon tomb , Séti1st,  RamsesII, III, VI. 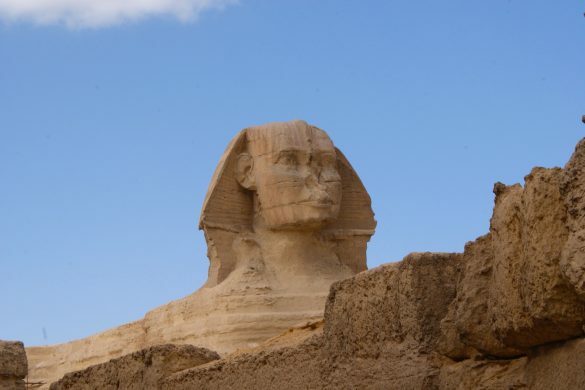 A giant Pharaoh was discovered according Science ? Thank you Constance !My Master Classes will be available in January2019 ! Little late …in French end of February and in English end of March !